Conquest was crowded, inside and out. Logan leads a tour at River Rat. This is what yeast does... it's now beginning to be beer. Samplers. 4 oz pours of fresh goodness. Sarah rocks likes her work! Since I've been a Stone Brewing fan forever, it seems, always heartened to hear of a new release, even if it's a stout instead of an IPA, for which they are justly famous. Stone has just released this video explaining about the latest version, released on March 23. Making me thirsty watching it being made! 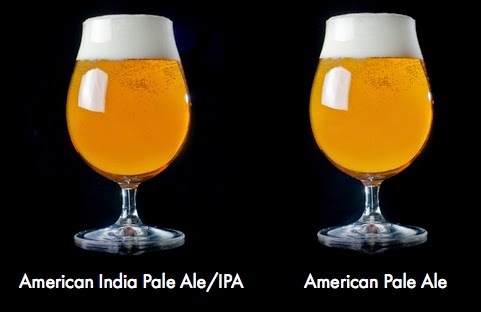 Found this and realized that it's one of the best visual guides to beer styles I've seen Most of the ones I have encountered are in print (the Cicerone study materials for example) but this graphic is colorful (tho I can't attest to the color accuracy) and easy to remember. Some memorable moments from our Sierra Nevada Brewing Company celebratory dinner last night: A beer flight of four tastes, pig cheeks, one of the small plate entreés we had and a discussion what makes an IPA glass special. Infamous and delicious Pig Cheeks with grits. Yes, there is a reason why the glass has that shape. Bar at the taproom showing the 24 beers on tap. What a fun and educational time at The Community Tap tonight, with Foothill Brewing coming in to take over the taps. Passed out chocolates to go with the Sexual Chocolate and talked with brewmaster/owner Jamie Bartholomaus about his success and what the future might hold. Great evening and a special venue for us Greenville folks. I've prepared a surprise.... some chocolate dipped truffles to pair with their Sexual Chocolate Imperial Stout, both the 2012 and 2014 versions.... yummie!!! Another Top Ten List, But This Time They're All Good! ... and of course we will be there to document the event and perhaps have a pint or so (for quality control purposes, of course). Visited Quest Brewing Company this morning, the local site of the first state-wide Pink Boots Society event: International Women's Collaboration Brewing Day. Pink Boots Society (PBS), is an international organization devoted to educating and empowering women in craft beer. The object of today's event is to brew, collaboratively, a designated style of beer, in this case an Irish Red, and release it two weeks or so down the road at an event which will draw attention to the organization and its goals. The ladies collaborating today are various areas of the craft beer community: brewery employees, bloggers, bartending, retail craft sales and growler refill stations. Some are even home brewers. Following the sparging, boiling, cooling and fermentation, the ale will be ready for all to taste, evaluate and drink. Very small amount so the tasting will be a special occasion. Harvin at Craftbeerchick.com will be a good source for further info. So, I caught some of the action in between sips of Melusine Biére de Garde and bites of Fields of Gold Farm Goat Milk Gelato made with Quest's Smoking Mirror Porter. One of my most challenging assignments! 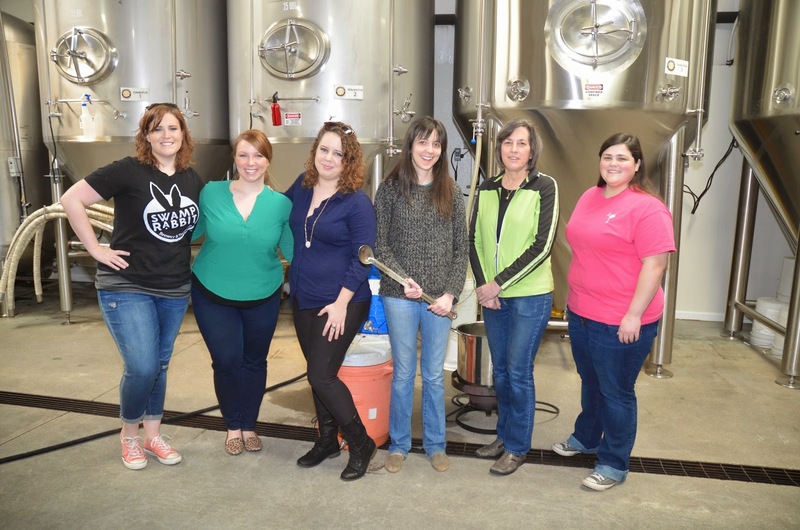 L to R: Caitlin Pierson, Swamp Rabbit Brewery and Taproom; Keats Wineland, beer enthusiast; Courtney Pici, Bartender/Homebrewer; Erin Gregory, Quest Brewing Company; Kathy Roberts, Crafted, The Beer Store; and Harvin Bedenbaugh, Blogger/Brewery 85 bartender, aka Craftbeerchick. Beginning of the sparging process. Getting ready for the boil. Now for a two week wait to taste it! !